Parkinson's Disease: What is it? Parkinson's is a progressive neurological condition. One person in every 500 has Parkinson's. People with Parkinson's don't have enough of a chemical called dopamine because some nerve cells in their brain have died. Without dopamine people can find that their movements become slower so it takes longer to do things. The main symptoms of Parkinson's are tremor, rigidity and slowness of movement. As well as affecting movement, people with Parkinson's can find that other issues, such as tiredness, pain, depression and constipation, can have an impact on their day-to-day lives. The symptoms someone has and how quickly the condition develops will differ from one person to the next. The above information is used courtesy of www.parkinsons.org.uk. David Blatt inspires others that skiing and sport can still be a part of life even with Parkinson's disease. "I hope to inspire people with Parkinson's disease and other neurological conditions to challenge conventional wisdom about what we should be able to do and what the disease is supposed to do to us. I love your website. 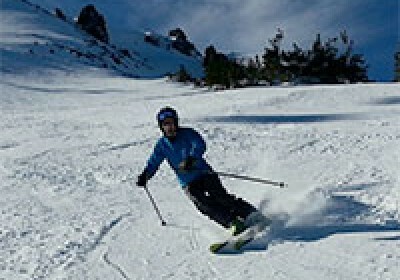 Skiing has been tremendously important in helping me live with Parkinson's disease and I would enjoy the opportunity to ski with you if you ever want to visit Oregon – thank you for the work Ski 2 Freedom is doing." A person who has Parkinson's Disease can ski and enjoy the mountains with family and friends but how and where will depend on the overall health and severity of their condition – for many people who were skiers before symptoms set in, it can be all about regaining self-confidence and learning to adapt their skiing if necessary. This might mean using a sit-ski rather than normal skis. For some this can bring about a lack of confidence BUT if this is the course open then once tried never look back the world again on the mountain is yours! Ski 2 Freedom has many clients who have discovered the joys of the snow and magic of the mountains. Most ski schools which have qualified instructors for disabled and adaptive skiing and snow sports should be able to work with people who have mobility issues and conditions relating to Parkinson's Disease. Your initial enquiry to the ski school should include as much background information as possible. If you have skied before, it can be incredibly useful to dig out old photographs or even video footage of you skiing previously to send to the ski school so that they can get a good idea of your level. Discussing in detail your specific needs and condition(s) is VITAL to ensure both the ski school and you know what is going to happen and to ensure you are matched with the right ski instructor and/or equipment. This may include a discussion about other associated health and social needs such as epilepsy, asthma, communication and social awareness skills and any recent medical developments. In some cases when a child is new to the slopes or not a very confident skier or there are mobility issues, then why not have an hour or so on the piste with a qualified ski instructor 1:1, then take the opportunity hiring the instructor to whizz you around the slopes with the rest of the family using a Tandemski or sit-ski (dual ski pilot) - you get the chance to relax a bit and be with family and friends! A lot of fun and laughter can be had! Many of the ski schools have a good idea of what is required especially when it comes to equipment and clothing, in particular the ski boots. Do ensure that you ask the ski school if they can recommend a ski hire shop for such items. Whether special ski equipment is required will depend on the degree of the disability. As Parkinson's is a progressive disease, your needs may change every time you ski so it is worth having an in depth discussion each time so that a good assessment can be made. In Europe, the US, Canada and worldwide there will be ski instructors with experience in disabled and adaptive skiing tuition, it is more than likely that whichever resort you choose there will be someone who will be able to help you. However, going somewhere where skiers with a similar condition have gone before, may well be a source of comfort and reassurance. We are delighted to be able to list below all of those schools, of which we have personal experience. If you would like information on other ski resorts contact us.